USP 2-0 with a 19 mm 3/8 circle reverse cutting needle, which is popular for procedures where a longer needle is desired. Cytoplast® PTFE suture is an ideal suture for regenerative and implant procedures where a soft monofilament suture is desirable. 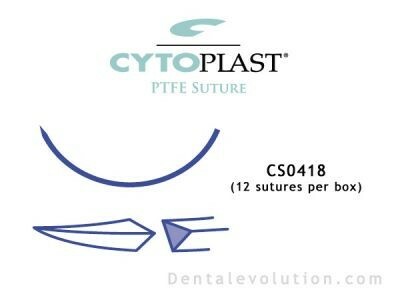 Cytoplast® PTFE suture’s monofilament construction doesn’t allow bacterial wicking into the surgical site, and unlike most monofilaments, patients like it because it is soft.